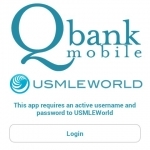 USMLEWorld Qbank Mobile App is an excellent addition for anyone who uses USMLEWorld. The interface is easier to use as compared to the desktop version. For long sessions, have a power cord on hand or use WiFi to save on battery life.